Zultys MX software Release 6.0+ for MX250 and MX-SE or MXvirtual IP phone systems. 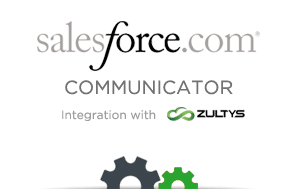 The Zultys Salesforce.com Communicator is available from your Zultys reseller for a one-time fee, priced on a per user basis. There is no monthly recurring charge. The Zultys Salesforce.com Communicator can be activated by Salesforce.com Professional, Enterprise or Unlimited Edition customers with a simple log-in activation step.